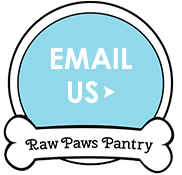 Welcome to Raw Paws Pantry, a Home Delivery service supplying high quality, human grade, frozen raw dog food and natural dog skincare products for healthy dogs or dogs with itchy, dry, sore skin. Our aim is to make our woofer friends the happiest and healthiest that they can be. Raw Paws Pantry will no longer be stocking Nutriment as a main range. We will still order Nutriment in for you as long as we received your order form by Sunday 6th January 2019. Please speak to Lynn or Sarah for further details. Subscribe to our blog and get regular updates on our pups, products and much more!